Our annual bulletin contains various special events that have helped us to become better in doing our advocacy. Subscribe now and grab a copy of our annual journal. is here, bringing in a new decade and milestone for the Annie Walsh Memorial School. In 2009, AWMS alumnae worldwide celebrated 160 years of excellent education for girls not only in Sierra Leone or the African continent, but also students from as far as India, Israel and New Zealand, who enjoyed and benefitted from quality learning at the Annie Walsh. We recognize that without the firm foundation grounded in us we could not have withstood what was waiting in the real world. This is another milestone for AWOGA Washington as we celebrate 25 years of serving our alma mater, the Annie Walsh Memorial School. What an achievement and as we look back we are proud that we have met most of the objectives of our charter and our commitment we made to the school. Each January as the New Year rolls in, the world waits with anticipation of what is ahead. None of us can predict what the year holds but we hope for the best. So it is with AWOGA Washington. We cannot tell what road we have to walk this year, but under new leadership and a dynamic executive committee we have an agenda and strategy in place, which we hope to achieve. This newsletter is the standard bearer for AWOGA Washington highlighting the previous year’s activities of AWOGA and the AWMS. 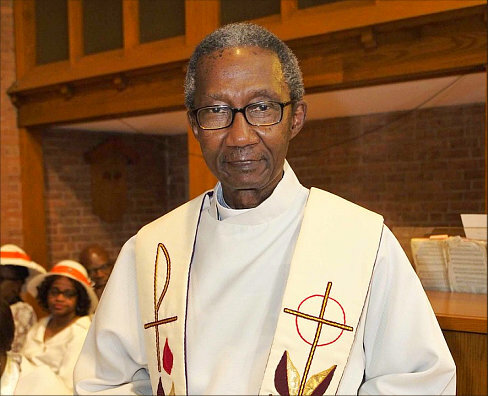 This year’s was destined to be a regular communication from AWOGA, but, just before publication news broke out that the Sierra Leone Government had proposed to His Lordship, Bishop Julius O. Lynch, Chairman of the Board of Governors and Head of the Diocese of Sierra Leone (Freetown and the North), that it would like the Board to consider the relocation of the school to a site acceptable by all parties. It seems it was only the other day that ex-pupils of the Annie Walsh Memorial School were feverishly planning to celebrate the 160th anniversary of the school. Events were organized worldwide. Bags were packed as AWOGA Washington members joined others for the big celebration in Freetown, Sierra Leone. Now, five years later, we are reflecting on our achievements and accountability of the results. In her 1992 Christmas Day speech to the Commonwealth, Queen Elizabeth II described the year as an “annushorribilis”. In other words a simply horrible year. It would come as no surprise if these were the sentiments expressed by all Sierra Leoneans, wherever their domicile or whatever their status, because of the Ebola epidemic that has ravaged the Mano River Union region. 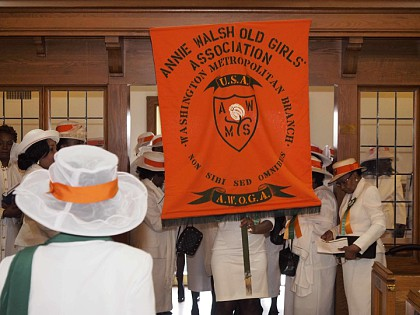 When the idea of starting a branch of the Annie Walsh Memorial School Old Girls Association in the Washington Metropolitan Area was conceived three decades ago, the founders had little idea of what this would entail; where this venture would lead, or the twists and turns they would encounter along the way. Nearly all of the founding members were parents and experts in parenting children ranging from infants to college students. For AWOGA Washington, this year is significant because at no other time in the history of the Annie Walsh Memorial School or AWOGA, has there been a more defining moment to come together on a strategic journey for our alma mater. As we assemble in our white dresses, black shoes with matching stockings; white hats adorned with orange hat bands and the AWMS pin, that ubiquitous badge of honor resting squarely on the left hand of the uniform; ex – pupils of the Annie Walsh Memorial School will once again show their allegiance and love for their school by joining in a service of thanksgiving. Our theme is “Pressing Towards Our Goal”. How do you like our new look? After more than 10 years we felt it was time for rebranding. Not only did we change the cover, but we also came up with a new name; AWOGA Connection. The word “Newsletter” was a misnomer and did not quite reflect its platform. Over the years the publication has evolved from sharing brief news about the Annie Walsh Memorial School to presenting reports, articles and news about the institution and the global AWOGA family. Sylvia Porter created the new design. She did a wonderful job. We love it and we hope you do, too. It is one of many we will be using in the future.